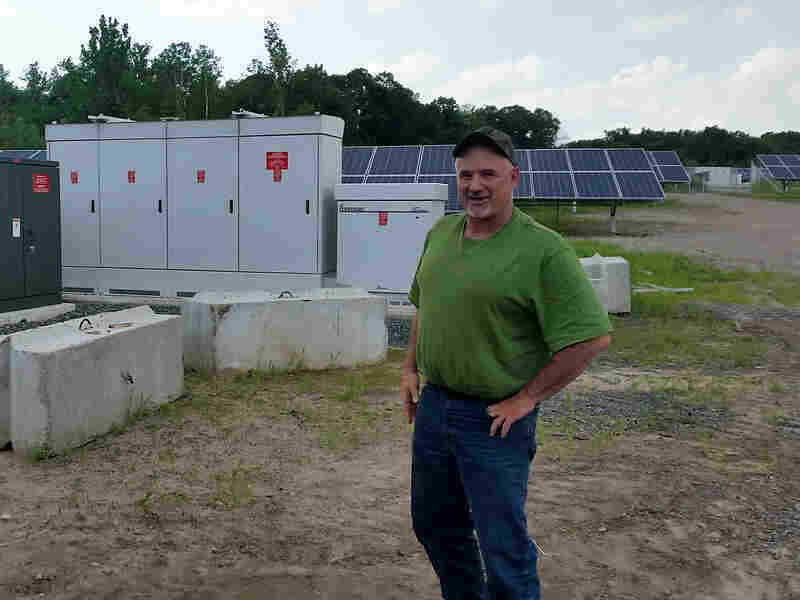 For New England Farmers Looking To Make Ends Meet, The Sun Provides A Harvest : The Salt Farmers in New England are renting parts of their land to solar energy developers, allowing the farmers to earn some much-needed extra money. But not everyone is happy about the trend. Farmer Kevin Sullivan put solar panels on a portion of his property in Suffield, Conn.
As Kevin Sullivan slowly rumbles his pickup truck across his 60-acre farm near the Connecticut-Massachusetts border, he leans in and asks: "What's farmland?" "You picture [a] cow," says Sullivan. Perhaps "Farmer Joe, like me." Maybe you think about my tomatoes and peppers, he adds. But now, Sullivan and other New England farmers are turning their farms into sources of another kind of commodity – electricity. They are allowing utility companies to set up solar panels on their land, and in the process making some much-needed extra money. Sullivan, like many New England farmers, had been struggling to make ends meet in recent years; a volatile market and slumping commodity prices have challenged many farmers in the region. And one part of Sullivan's property – about 15 acres – had been pretty unusable. The soil was heavy and bad for crops, he says. He tried growing corn and hay, but with no success. Then a solar developer came along, offering him a lot of money to rent the land, put up solar panels, and sell that energy back into the grid. He says the opportunity was too good to pass up. "The money that comes off that acreage exceeds anything else I could do out there," Sullivan says. For solar developers, southern New England is ideal. Tax credits and locked-in contracts with power utilities can help the finances work out. And many New England farms are basically "move-in ready." Kevin Sullivan in front of the solar array on his property. "It's a large tract of land that's flat and already cleared — and it's right next to a big transmission system," says Jeff Grybowski, the CEO of Deepwater Wind, speaking at a meeting to explain his company's plans to buy up some land outside of Hartford. "It is a perfect place for a solar project," he says. The company wants to put panels on about 156 acres, some of which is rented to farmers to grow crops. 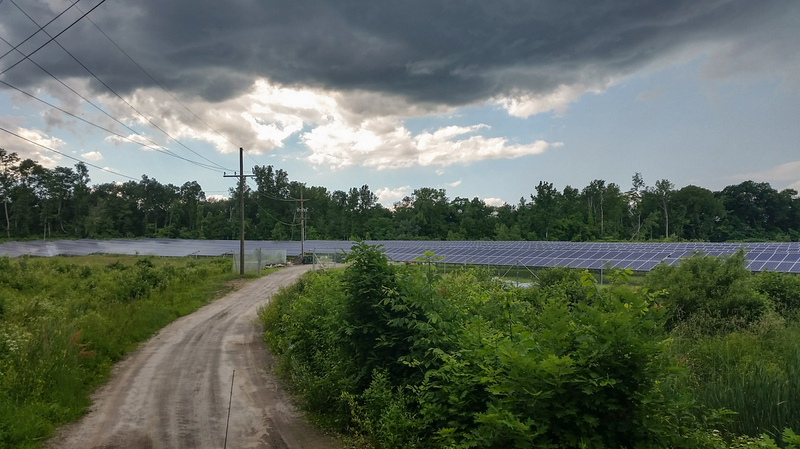 If successful, it could be New England's biggest solar project – powering about 5,000 homes. But the idea has stirred up some controversy. Some residents think the project is a waste of agricultural space in a densely populated state and have opposed the project at public meetings. And some farmers feel conflicted about the issue. "It's one of those issues, you know, call me in 10 minutes and I'll be on the other side of it," says Benjamin Freund, who runs a farm in East Canaan, Conn.
Freund says he used to just compete against other farmers when looking for land to rent. Now, he's up against deep-pocketed solar developers, who can offer more money to a potential landlord. But for farmers who own property, he thinks land use should remain a personal choice. "We want to have the ability to use our land for whatever we feel is its best and highest use," Freund says. "On the other hand, we don't want to have to compete against an industry that's fairly highly subsidized." And while some states are working to steer solar to places like old landfills and get more environmental oversight, Massachusetts is proposing to offer more money for projects where farming and solar co-exist. They call it "dual use." Johnny Rogers is a livestock farmer who also works with North Carolina State University, educating farmers about pasturing animals. He says he started thinking about dual-use three summers ago when he got a call from his landlord telling him he had agreed to put solar on a portion of the pasture that Rogers is renting. "We actually live on that same farm. So it did literally hit pretty close to home," he says. So Rogers asked the solar company if it would let him keep sheep on the property – munching on the grass to make sure the panels stayed clear of brush. He said he now gets calls from other farmers and solar developers asking about the idea. "You're harvesting solar energy as electricity," he says. "Then you're harvesting solar energy as protein, basically, through the lamb that would be produced." Farmers are resilient, Rogers says. And while he hates to see crops disappearing, he says solar has provided a lifeline to some farm owners in rural parts of his state. The extra money, he says, can stabilize balance sheets and ensure that land stays farmed, in one form or another.